I tend to go through phases with colors. 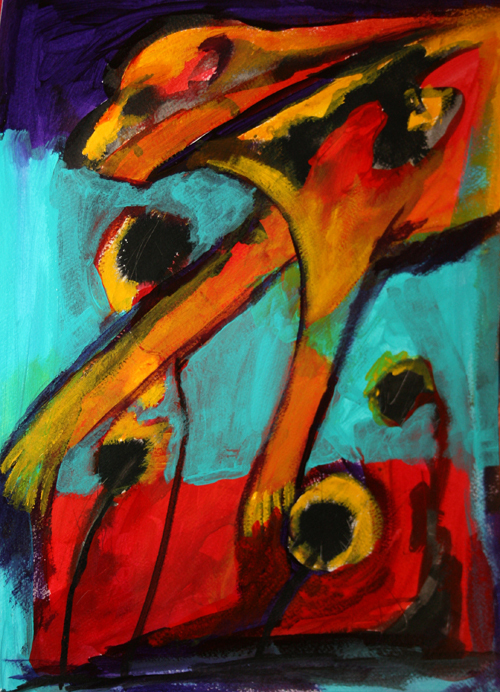 Blues are a constant, but I've also had phases where reds and oranges play a larger part in my work. This past year, while pregnant, I found red to represent a connection to life and blood. But prior to this year, I've used reds to express intense emotions, anger, passion, or just plain old fire. It feels good to let emotions out in paint. The Red Bear painting I shared at the beginning with this month's theme post is a prime example of that. I was feeling supremely frustrated that day. As I painted intuitively, the red bear appeared. 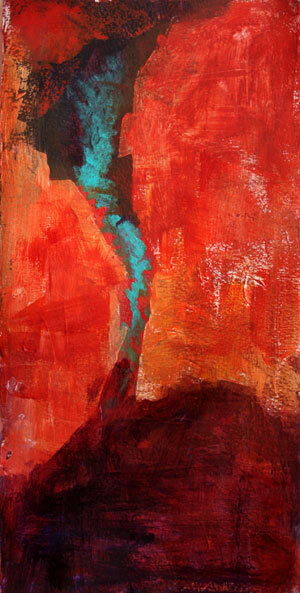 At other times, I've enjoyed painting with reds in a more abstract manner. Red feels so powerful and intense! How have you used reds to express your emotions in art? I love using red… red is one of my favorite colors. I love the pieces you posted, lots of energy. I have a hard time focusing on a certain color, all the other colors tend to sneak up into my paintings. like this one: http://marciabeckett.blogspot.com/2011/08/red-configuration-on-canvas.html It is titled a Red Configuration, however you can see that most every color in the rainbow is in it. that Leap piece totally WOWs me! wow. Red is very intense for me and a great way to express intense emotion. for me it is usually anger, frustration, angst or addictive cravings, also sometimes lust. Looking at your body of work, it’s easy to see what colors you tend to be drawn to. Although I go through my “phases” with different colors, I find that I do use a lot of red. Love the drama! I love the Leap image! I am a teacher so school started and I have been busy getting ready. But, RED is on my mind so this weekend I have plans to splash red paint about. Cheers! i love using red when i feel stong emotions or sometimes red brings on the emotions. it’s a great motivating color. Love these pieces Leah, and your Leap piece in particular is wonderful! As an appreciator of art, I love the messages that colour conveys, and I find myself drawn to particular pieces depending on my mood and what emotions I need to draw on or tap into. To me, red can symbolize anger, love, passion, etc. and I also see it as very powerful feminine colour – representing wisdom and feminine power, blood and menstruation… The Red Tent comes to mind. Great pieces, Leah. You’ve covered the bases here. I usually use red for life, power, sexual energy (essentially the same thing). Once I did a science project with 30 six year olds to test what meaning they associated with which color and red was always “angry”.